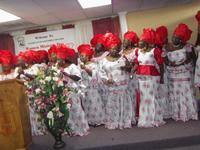 This is a special ministry with the desire to bring out the various God given gifts and talents to bless every woman. * To teach the women how to be effective prayer warriors. * To educate them to understand their role in the church, family and the community. * Give them spiritual training and to help them develop the character of a total woman. 1.Health: Good nutritions, Healthy grocery shopping. 2.Home Management: Managing homes, husband, children, home decor, budgetting etc. 3.Organizing Seminors on: Pediatric, Pregnancy especially new mothers, Marriage, Sexual related problems. 4.Outreach: Visitation of those in need, Nursing homes, Abuse homes, etc. If you are new in Houston Texas, we encourage you to join us to worship and be part of our ministry. We promise your life will never be the same.